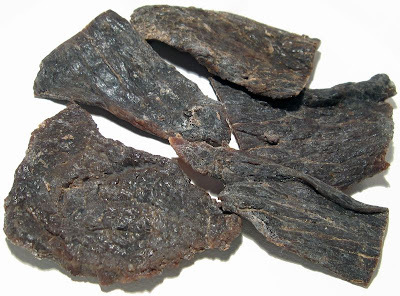 The line of jerky offered by North Prairie Signature is actually the same jerky once offered by Natural Premium Meats International, Inc. (NPMI). North Prairie Signature purchased their shelf-stable line of meat products in January 2008, which effectively launched the new company. NPMI's products were all made using bison meat from North Prairie Bison Ranch. Bison, water, salt, sugar, pepper, spices. The flavors I pick up from the surface of these pieces is a meaty aroma, some saltiness, and some black pepper flavor. In the chewing, the flavor I get is a natural meat flavor, some more saltiness, and a good deal of black pepper flavor. It seems like I can also taste some garlic too. My initial thoughts on this is that as a peppered jerky, it does have a good deal of black peppery flavor, but compared to the original variety I reviewed earlier, I'm not sure if this has more peppery flavor or not. The two varieties seem pretty close. But like the original variety, this has a strong dose of natural meat flavors. This doesn't at all taste like beef, which bison meat is often described as. This has a clearly different taste, perhaps something halfway between beef and venison. It's got the smoother, sweeter taste you find in venison, but still with some resemblance to beef. As a peppered variety, this jerky certainly does stand up to that claim. I'm getting some pepper flavor from the surface, but most of the flavor comes in the chewing. It's very distinct, and leaves behind a strong aftertaste. Some people might actually find this as having some "hotness", though for me it's still mild. The level of saltiness seems on the high side, but not quite reaching what I would consider as "too salty". On an individual piece, I still sense quite a bit of saltiness, but over several pieces, it's almost to that point of being too salty. And I'm also getting a garlic aftertaste in there. The sugar mentioned in the ingredients list is quite faint, hardly noticeable. These appear to be slices of whole meat, sliced to an average thickness, and in medium sized pieces. It's a dry jerky, though still maintaining a good deal of flexibility. It's fairly easy to tear apart with my fingers, though maybe some extra effort in some pieces. It's chews more easily, however. The chewing texture seems largely steak-like, with a fibrous quality, similar to a steak cooked medium to medium-well. Like with the original variety, there's a rubbery feel to it in the first few chews, but it quickly breaks down and provides a pleasant chewing experience. As a bison jerky, at the same $3.03 per ounce price, it's a decent value. That is, if I specifically wanted a bison jerky, then I what I'd want is something that offered the unique flavor of bison, and this jerky does seem to give out that quality. Because of the higher price, this won't be a jerky you'll snack on everyday, but maybe something you want to pull out when you're in the mood for something unique. Furthermore, as a peppered variety, it's a weak value. 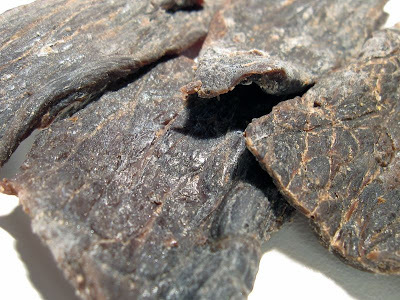 While this jerky actually provides a strong black peppered taste, the price of $3.03 per ounce is just way high if all you want is peppered jerky. 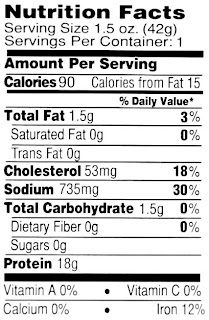 Wal-Mart's store brand of beef jerky includes a strong peppered variety, for far less. If you go back to my review of this brand's original variety, I said I was debating on giving this a good or best rating, and opted to give it a good rating, mostly out of a technicality because it was an original variety whose seasonings were competing against the natural meat flavors. Well, this black peppered variety is not really all that different than the original variety, but it gets the "best" rating because it's focused on what it's billed as, a peppered bison jerky, providing a great bison flavor, strong peppery flavor, with a great chewing texture. It's actually only a little bit more peppery than the original variety, but then again the original variety already has a strong peppery flavor. That bison flavor in this jerky is quite exceptional I think, in that it has a clearly distinguishable taste from beef. You can tell this isn't beef just by tasting it. Oddly enough, that's a quality missing in many other bison/buffalo jerky brands. And not to forget, the chewing texture is quite good, providing a satisfying experience. It's fairly easy to eat as well. My recommended beer choice for this, a stout.